Astron Specialty Metals Limited is a full service fabricator of stainless steel, aluminum & steel. Focused on water treatment, pharmaceutical, food processing applications, industrial, institutional and pollution control equipment. Astron’s scope includes success in custom made to order projects, small production runs and repeat blanket contracts for various industries that deliver our products across North America and around the world. We fabricate using customer supplied drawings or we have Designers on staff with SolidWorks and AutoCAD capabilities that have the expertise to take your concept and ideas and create 2D or 3D models. With our CWB Certified welders, there is nothing too big or too small that we are not capable of completing. 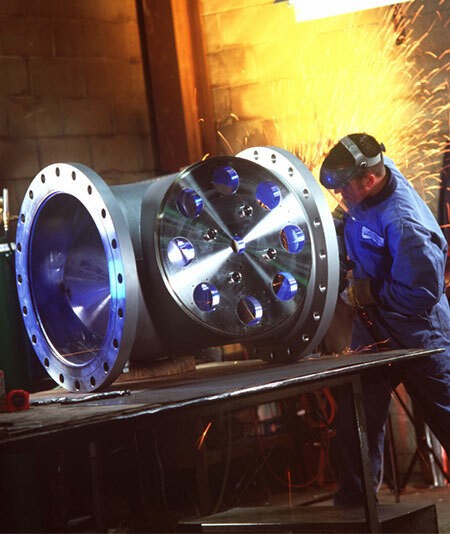 Our high quality fabrication methods allow us to meet challenging requirements and tolerances. Whether you require a high grade furniture polished finish to a #5 sand blast finish Astron is set up to meet your finishing requirements. Astron is a diverse company and is able to handle different projects with varying complexities. Solution provider focused in Water Treatment, Food Processing, Pharmaceutical, Industrial, Institutional and Pollution Control Equipment. Manufacturing enclosures, sinks, tables, racks, carts, conveyors, machine cladding, small and large tanks, machine bases, meat mixers, pollution control vessels and more, all to customer specifications. Specialize in Stainless Steel, Aluminum and other Metals. Copyright ©2019 Astron Specialty Metals Limited.